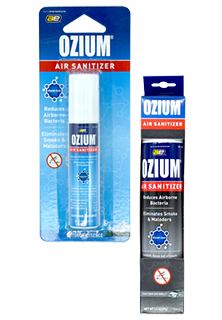 Keep the air you and your family breathe in your car or home, fresh and clean with Ozium®. Originally developed to combat airborne bacteria and germs in hospitals, Ozium® is clinically proven to ELIMINATE offensive odors, not just mask them. It’s great for car odors that just won’t go away on their own and is especially effective in eliminating smoke odors. Because it kills the bacteria that causes the odor, it eliminates the smell completely. Also, for flu season count on Ozium® to eliminate airborne germs and help keep the family healthy. We have the lowest prices in the nation. - GUARANTEED!